Synthetic peptide conjugated to KLH derived from within residues 1 - 100 of Rat NMDAR1. Our Abpromise guarantee covers the use of ab17345 in the following tested applications. WB Use a concentration of 0.5 - 2 µg/ml. Detects a band of approximately 110 kDa (predicted molecular weight: 105 kDa).Can be blocked with Rat NMDAR1 peptide (ab17568). NMDA receptor subtype of glutamate-gated ion channels with high calcium permeability and voltage-dependent sensitivity to magnesium. Mediated by glycine. 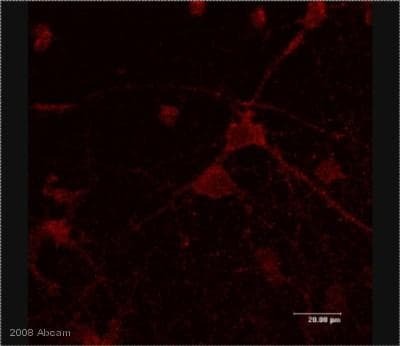 This protein plays a key role in synaptic plasticity, synaptogenesis, excitotoxicity, memory acquisition and learning. It mediates neuronal functions in glutamate neurotransmission. 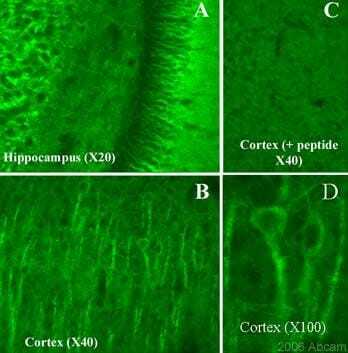 Is involved in the cell surface targeting of NMDA receptors. Belongs to the glutamate-gated ion channel (TC 1.A.10.1) family. NR1/GRIN1 subfamily. NMDA is probably regulated by C-terminal phosphorylation of an isoform of NR1 by PKC. Dephosphorylated on Ser-897 probably by protein phosphatase 2A (PPP2CB). Its phosphorylated state is influenced by the formation of the NMDAR-PPP2CB complex and the NMDAR channel activity. Cell membrane. Cell junction > synapse > postsynaptic cell membrane. Cell junction > synapse > postsynaptic cell membrane > postsynaptic density. Enriched in post-synaptic plasma membrane and post-synaptic densities. Additional bands at: 54 kDa. We are unsure as to the identity of these extra bands. NMDAR1 has a predicted molecular weight of 105kDa; however it has a number of potential glycosylation and phosphorylation sites which may affect the migration of the protein (SwissProt data). In addition, a band at 37kDa has been observed (data not shown). ab17345 Rabbit polyclonal to NMDAR1 immunofluorescent staining in the rat brain cortex. Primary antibody ab17345 was incubated at room temperature overnight at 0.5µg/ml. Preincubation with the immunizing peptide (ab17568) resulted in complete blocking of the primary antibody staining. Anti rabbit alexa fluor 488 secondary antibody was used at 1/1000 (incubated for 2h at room temperature). Protocol details: rat tissue was intracardially perfusion fixed with 4% PFA followed by an overnight post fixation in the same fixative, cryoprotected in 20% sucrose and frozen in OCT. As expected NMDAR1 staining is observed in the soma, axon and dendrites of neurons. Observed band size: ~110 kDa why is the actual band size different from the predicted? HEK293 cells were co-transfected with NMDAR1 (expected MW ~ 105kDa) and NMDAR2A (expected MW ~ 180kDa). ab17345 NMDAR1 antibody specifically recognises NMDAR1 protein and does not recognise NMDAR2A protein. ab17345 was incubated overnight at 4°C at 2µg/ml.